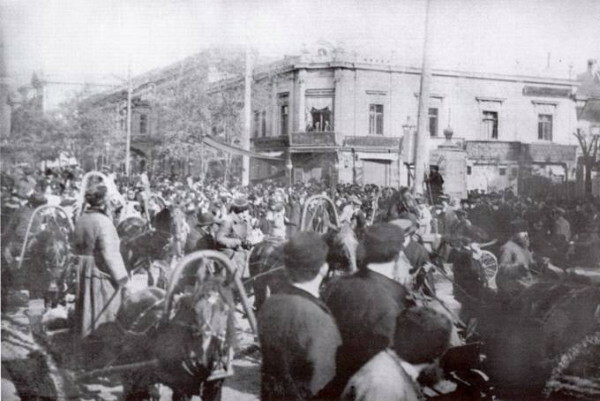 Revolution of 1905. A period of revolutionary unrest and radical reform in the Russian Empire in 1905–7. The revolution broke out on 22 January 1905, when the tsarist authorities opened fire on a peaceful demonstration of workers in Saint Petersburg. During the next few weeks workers throughout the empire went on strike, including those in the Ukrainian cities of Katerynoslav, Kharkiv, Kyiv, Mykolaiv, and Odesa. By mid-April some 810,000 workers had gone on strike in the empire, 170,000 of them in Ukraine. 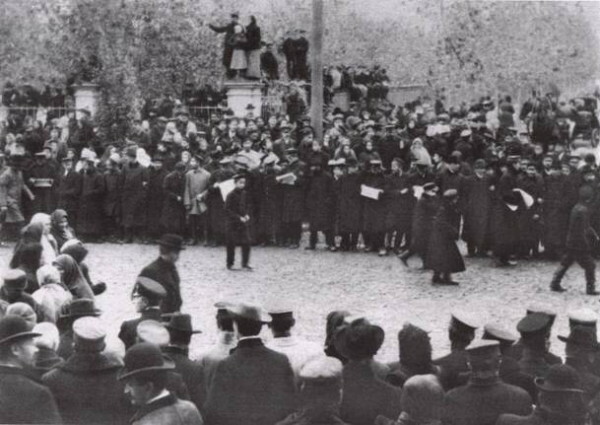 The strike movement reached its peak in the fall of 1905 and continued, with declining intensity, into 1907. Strikes in Kharkiv and elsewhere escalated into armed confrontations between workers and representatives of the state. In the fall of 1905, workers' councils or soviets (radas) began to appear in Katerynoslav, Kyiv, Luhansk, Mariupol, Mykolaiv, Odesa, Oleksandrivske, Yuzivka, and other Ukrainian cities. The revolution spread to the military, particularly the Black Sea Fleet. 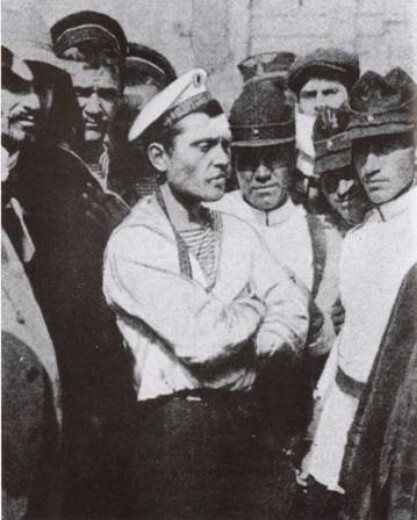 In June 1905 the crew of the battleship Potemkin in Odesa harbor mutinied; one of the chief leaders of the mutiny was the Ukrainian P. Matiushenko, and another prominent mutineer was Oleksander Kovalenko, who had been a founder of the Revolutionary Ukrainian party. In November 1905 the crew of the cruiser Ochakov, off Sevastopol, also mutinied. Peasant unrest was a characteristic feature of the revolution in Ukraine. A wave of agricultural laborers' strikes engulfed Right-Bank Ukraine in the spring and summer of 1905, 1906, and, to a lesser extent, 1907. Among Ukrainian political parties the most active in support of the peasant movement was the Ukrainian Social Democratic Spilka. In the face of widespread social unrest Tsar Nicholas II made concessions to the people in a manifesto of 30 October 1905. Among other things, the October manifesto established a limited parliament, the State Duma, in which Ukrainians participated in 1906–17 (see Ukrainian caucus in the Russian State Duma). The manifesto also promised fundamental civil rights, including freedom of the press and freedom of association, which did much to accelerate the development of the Ukrainian movement in the Russian Empire. Even before the tsar's manifesto, in March 1905, the Academy of Sciences in Saint Petersburg had declared that the Ukrainian language was not a dialect of Russian but an independent Slavic language, and recommended that the restrictions placed on it by Petr Valuev's circular and the Ems Ukase be lifted. In the wake of the October manifesto Ukrainian newspapers and journals began to appear in Kharkiv, Kyiv, Lubny, Odesa, Poltava, and elsewhere. In 1906, 18 Ukrainian periodicals appeared. The most important periodical of the era was the daily newspaper Hromads’ka dumka, which was succeeded by the daily Rada (Kyiv). The fortunes of the Ukrainian periodical press waned with those of the revolution. Beginning in late 1906 the interference of the authorities substantially limited Ukrainian-language publication. Although some attempts were made during the revolution to introduce the Ukrainian language into educational institutions, those attempts were immediately thwarted by the Russian government. The revolution witnessed the proliferation of Ukrainian voluntary associations. Branches of the adult educational and cultural society Prosvita were established in Kyiv, Odesa, and about a dozen other cities; numerous branches were also established in villages. Few, however, survived the reactionary period that began in 1907. Several hundred Ukrainian co-operatives also appeared in 1905–7. Various other musical, dramatic, and educational clubs emerged during the revolution in Ukraine. To fight the revolution the Russian government and reactionaries stirred up an extreme Russian nationalism that was antisocialist, anti-Semitic, and anti-Ukrainian. The nationalists, known as Black Hundreds, organized pogroms against Jews and against supporters of the revolution. Moderate Ukrainian politicians condemned the anti-Jewish pogroms in their organ Ukrainskii vestnik (Saint Petersburg); revolutionary Ukrainian activists, especially members of the Ukrainian Social Democratic Workers' party, organized self-defense units to combat the pogromists.